This is a mid century modern low dresser credenza by American by Martinsville. It has a 9 dovetailed drawers with a linear design, surfboard edges, and tapered legs: 76″W x 19″D x 30″H. This is a mid century modern credenza by Bassett. It has 3 streamlined drawers, 2 side cabinets, and a floating base with tapered legs. The dimensions are: 60”w x 18”D x 30”H. This is a mid century modern credenza with 7 dovetailed drawers an undulating design and ring pulls. It also has a middle cabinet with a shelf, and tapered legs. Dimensions: 64″W x 19″D x 30.5″H. This is a low dresser credenza from Kent Coffey’s Perspecta series, with 9 dovetailed drawers with their signature arched design, and sculpted tapered legs: 64″W x 19″D x 31″H. This is a mid century modern credenza with 3 dovetailed drawers, and 2 side cabinets with Danish pulls, faux rosewood accents, and tapered legs: 60″W x 18″D x 30″H. This is a mid century modern credenza that has 3 dovetailed drawers with a streamlined drawer design, right side cabinet, and tapered legs. Dimensions: 50″W x 18″D x 30.5″H. These are 2 mid century modern dressers by Stanley. Both dressers have their signature silver accented dovetailed drawers. The low dresser credenza has 6 dovetailed drawers: 52″W x 18″D x 30″H. The bachelor dresser has 3 dovetailed drawers: 32″W x 18″D x 30″H. These are mid century modern high and low dressers by Heywood Wakefield. They have a sculpted drawer design, beautiful brass knobs accented in a pearly eggshell enamel, tapered legs, and are finished in their signature sable finish. The tall dresser has 2 tambour doors that open up to 2 drawers and cubby shelves, with an additional 3 drawers below: 41″W x 20.5″D x 45.5″H. 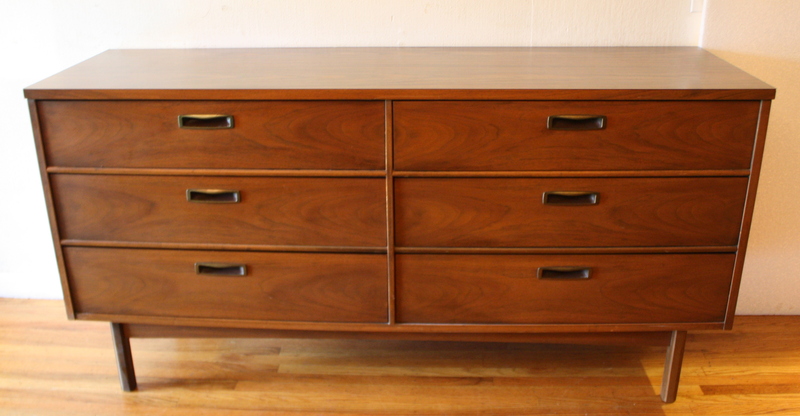 The low dresser credenza has 9 dovetailed drawers: 65″W x 20.5″D x 31.5″H. This is a mid century modern credenza by Stanley. It has beautiful brass details in its front tapered legs, 3 dovetailed drawers with a streamlined design, and 2 doors that open to side cabinets with shelving. Dimensions: 50″W x 17″D x 30″H. These are 2 mid century modern low dresser credenzas. Both dressers have a beautiful parquet design and tapered legs. The first low dresser has 9 dovetailed drawers: 59″W x 18″D x 31″H. 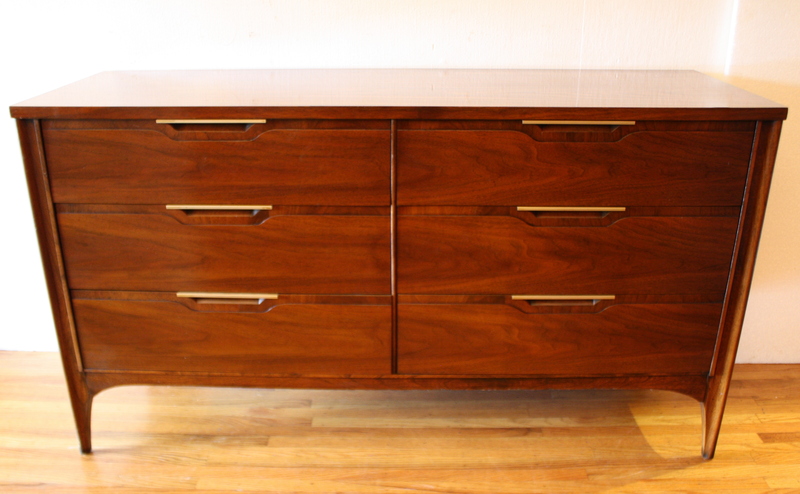 The second credenza has 1 side cabinet, and 3 dovetailed drawers: 52″W x 18″D x 31″H. Both parquet low dresser credenzas are sold. This a mid century modern high and low dresser credenza by Johnson Carper. Both have their signature concave drawer design and tapered legs. The tall dresser has 5 dovetailed drawers: 36″W x 18″D x 44″H. The low dresser has 6 dovetailed drawers: 50″W x 17.5″D x 30″H. This is a matching pair of mid century modern high and low dressers. They both have a streamlined drawer design, brass pulls, and arched bases with tapered legs. The low dresser has 9 dovetailed drawers: 64.5″W x 18.5″D x 31″H. The tall dresser has 4 dovetailed drawers: 40″W x 18″D x 42.5″H. 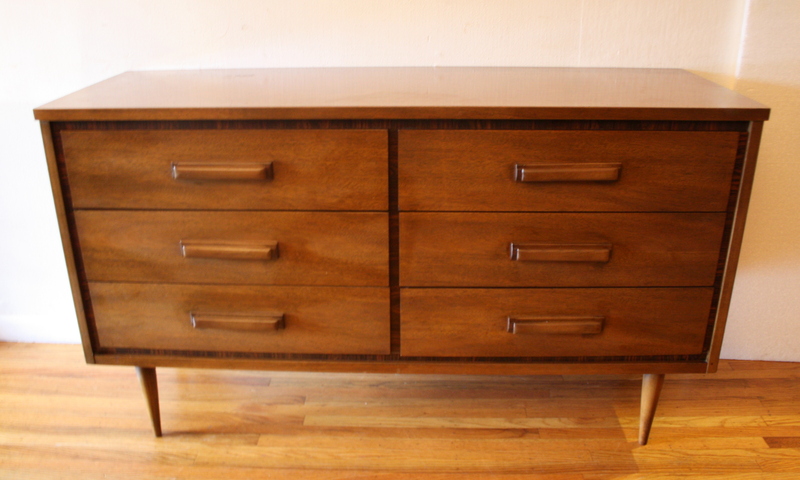 This is a mid century modern credenza from the Broyhill Emphasis collection. It has Broyhill’s signature sculpted legs, handles and doors. There are 3 dovetailed drawers and 2 side cabinets: 66″W x 19″D x 30.5″H. This is a selection of mid century modern low dresser credenzas. The first is from the Kent Coffey Impact collection. It has their signature sculpted tapered legs, and 6 dovetailed drawers with a streamlined design and brass handles: 56″W x 18.5″D x 31″H. The second is by Bassett, has a parquet accented design, 6 dovetailed drawers with carved wood handles and tapered legs: 52″W x 18″D x 30.5″H. The third low dresser has a 6 dovetailed drawers with sculpted handles, and a beautiful wood grain: 60″W x 18″D x 30H. All low dressers are sold.